Abe and Putin meet in Moscow. Both want better relations. Will old challenges get in the way? An odd historical fact: Japan and Russia at the end of the World War II never signed a formal peace treaty ending hostilities. With Tokyo and Moscow looking to strengthen ties, will old challenges get in the way? Prime Minister Abe travelled to Moscow on Sunday. He was the first sitting Japanese Prime Minister to make the trip in ten years. In a press conference at the conclusion of talks, Abe declared three goals for his visit: "to show or demonstrate future opportunities for Japanese-Russian relations; second, to renew talks on the peace treaty; and third, to establish better, trust-based relations with [the] President of the Russian Federation, Vladimir Putin." It seems some progress was made in many of these areas. In terms of creating "future opportunities," or creating better relations between both countries, Tokyo and Moscow agreed to "to launch consultations between our foreign policy and defense agencies at the ministerial level employing the so-called ‘Two Plus Two’ formula." Abe also remarked that he hoped "this will greatly increase the level of cooperation between our two nations, Japan and Russia, in providing security and defense." However, any talk of better relations is comical without the creation of a formal peace treaty ending World War II. It seems both sides understand this important point. President Putin explained that both men had "instructed our Foreign Ministries to step up contacts on reaching a mutually acceptable solution to this problem. The Joint Declaration on Developing Bilateral Partnership that we adopted at the end of our talks follows the same direction." 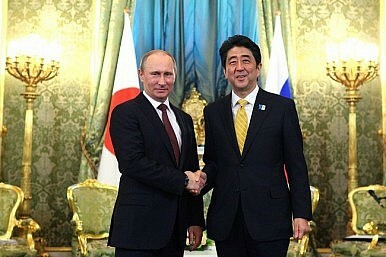 "The Abe visit to Russia was well timed coming as it does on the heels of some difficult weeks for Japanese diplomacy. The promise of the peace treaty finally coming to pass is also a welcome prospect," says Sheila Smith, a senior fellow for Japan studies at the Council on Foreign Relations. "The lack of a postwar settlement between Moscow and Tokyo, frankly, has been unnatural and unwise for both countries. There is much to be gained economically, of course, but there is also the strategic benefit to both countries of having a deeper and more productive dialogue on the rapidly changing Asian region." Prime Minister Abe also stressed the importance of negotiating a peace treaty and said that "a peace treaty between Japan and Russia not being signed 67 years after the end of the [World] War, is not normal." "But during today’s talks, we were able to agree that we will renew negotiations, and we will accelerate this process. I believe this is a major result of our meetings." However, peace treaty negotiations will prove a challenge if Russia and Japan are unable to solve contested islands that both have claimed for decades. Japan claims sovereignty over the Northern Territories (referred to as Southern Kurils by Russia). "First, a question to Prime Minister Abe. So long as the territorial dispute over the northern territories remains unresolved, the Russian side is developing and setting up the infrastructure in these islands. For example, companies, including foreign companies or ones with foreign participation, are advancing projects in construction, as well as building geothermal stations and other facilities. In other words, the islands are still essentially governed by Russia. This reality is unacceptable for the Japanese side. How would you comment on this situation? And my question for President Putin. Does Russia intend to continue such a policy in those territories? If so, then how, in your opinion, this may influence the peace treaty negotiation process with Japan? "Yes, as far as the current situation is concerned, it does not align with the Japanese side’s position. But our joint statement with President Putin includes language about how the sides will strive to overcome the disputes in our two nations’ positions. In order to fundamentally resolve the situation, the only thing we should do is resolve the issues pertaining to the northern territories. President Putin and I agreed today that we will accelerate this negotiation process. This means that we will speed up the peace treaty negotiation process." "I noticed that you conscientiously read your question from a piece of paper. I would like to request that you say the following to those who dictated this question to you: we did not create this problem. We have inherited it from the past and it is nearly 100 years ago. We genuinely want to resolve it in a way that is acceptable to both sides. If you want to help us, you can: you must create conditions of good will toward one another and a trusting environment. But if you want to get in the way, which is also possible, then you can ask harsh, direct questions to which you will always receive equally harsh, direct answers. How else can it be? In this case, I would like to say that the residents of these territories are Russian citizens just like all our other citizens living anywhere else. We are obligated to think about them, to think about their living standards. The Russian Federation’s official position on signing a peace treaty is well-known, but we did not gather here to discuss it today. Instead, we gathered to renew peace treaty negotiations and find ways to solve this problem." Despite this tense exchange, could a deal be signed that would lead to strong relations between Tokyo and Moscow and a resolution to outstanding territorial claims? "The Cabinet Secretary's announcement that Vice Ministerial level consultations on the peace treaty will be initiated immediately suggests that there is some momentum coming out of the summit, and this should produce the contours of a broad vision for Japan-Russian cooperation, including the disposition of the Northern Territories," noted Smith. "While I do not anticipate an immediate resolution of the sovereignty question, I do think there is ample room for a new way of managing their differences that could lead to resolution in the longer term." Does Putin Have a Kuril Islands Plan? Could a 50/50 split of disputed islands bring an end to Japan and Russia’s conflicting claims?